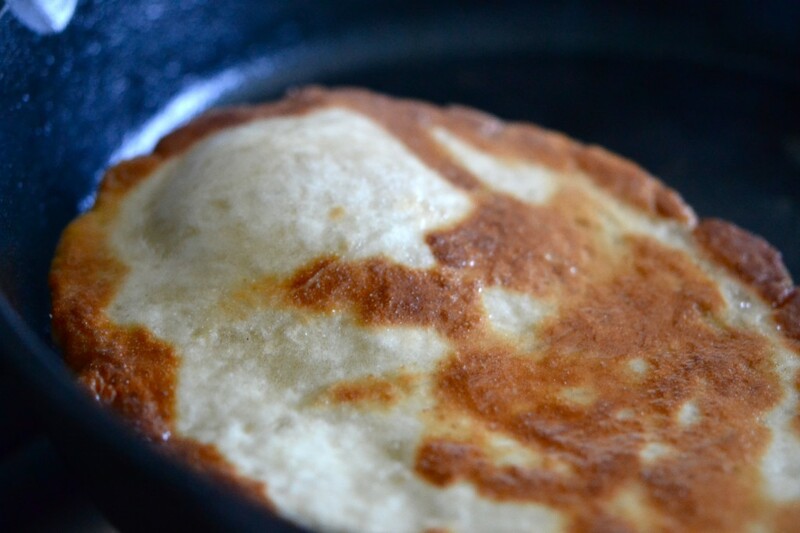 This gluten free naan bread is made extra soft and tender with yogurt, eggs and a bit of butter or ghee in the dough. Make the dough ahead of time, and then fry it up in a pan in minutes! Naan is a flatbread that very similar to pita bread, but it’s a pretty highly enriched bread. In bread-baking, enrichments just refer to things like fat (ghee and butter here in this recipe), yogurt or milk, and eggs. These enrichments, especially the yogurt in this recipe, make this bread dough quite easy to handle—and the resulting naan bread tender, fragrant and delicious. This bread recipe is made in the “old style,” the kinds of bread that I think of as the first generation of gluten free yeast bread baking. I’ve developed plenty of gluten free bread recipes like that, and they work, taste great and are a lovely starting-point. The first generation of gluten free bread recipes was in the “batter-style,” with dough made with a paddle attachment in a stand mixer that had to be much wetter and more fragile than conventional yeast-bread baking. Plus, they all require enrichments to compensate for any real replacement for the gluten that is so essential to conventional yeast-bread baking. The one drawback of the preparation of the old-style bread recipes is that they call for using the paddle attachment of a stand mixer. A handheld mixer won’t work. A bowl with a spoon and a lot of elbow grease might work, but I find that it’s quite difficult to get the proper consistency that way. The newer style can be made using a handheld mixer with the dough hook attachments. When I wrote my third book (GFOAS Bakes Bread), I set out to break the mold on gluten free bread. I added some special ingredients that really substitute for gluten in the newer yeast bread recipes, and I adore them. But I do understand that the newer style of gluten free yeast bread baking that I created in Bakes Bread is not a realistic possibility for everyone. It requires that you hunt down two new ingredients, Expandex modified tapioca starch and whey protein isolate, both of which thankfully have become much more readily available since the publication of that book in 2013. Plus, that sort of traditional yeast-bread baking is enough art-plus-science that I created an online course called Gluten Free Yeast Bread Basics for those of you who wanted a deep dive. The beauty of those recipes is that the dough is much more what you’d expect from gluten-containing bread dough, and the bread can be made into any artisan style at all. There’s even a whole chapter on wild-yeast sourdough bread in the book. It stays fresher for longer, and is actually much easier for bakers who can have dairy, but can’t have eggs since there are a lot of “lean” recipes in the book that don’t require butter, yogurt, milk or eggs. The simpler-style gluten free yeast bread recipes like this one are still really valuable, even in my house where I have all of the ingredients to make the “newer” style of gluten free yeast bread. 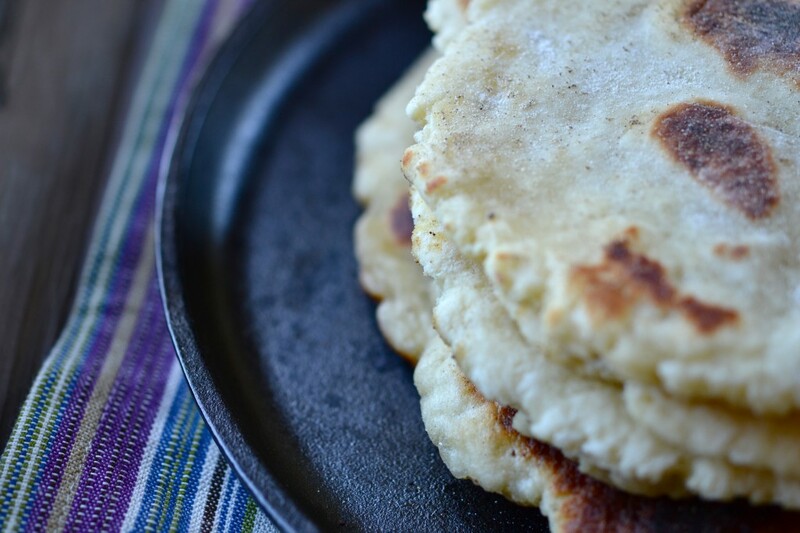 There’s a recipe for gluten free naan using the “new” ingredients in Bakes Bread, but this recipe makes such soft, delicious naan that I thought it was time to highlight it. This type of recipe just really calls for dumping all of the dry ingredients (flour, salt, cream of tartar, sugar, yeast) in the mixing bowl, and then whisking them. The wet ingredients (yogurt, butter, eggs, and water) are next, and then the mixer does all the work. At first, the dough will really look like fluffy batter, but when you scrape down the mixing bowl with a spatula, it should come away clean. The dough will still be tacky to the touch, but hold together really well when you set it to rise. Since the dough itself is quite wet, you can use a fair amount of extra flour to shape it, but work with it using a very light touch so you don’t incorporate too much flour. Yeast bread that is too dry simply won’t come out fluffy no matter what else you do. Shape a piece of dough loosely into a round, and then roll it into an elongated oval. While you’re shaping the dough, heat a heavy-bottom skillet (preferably cast iron) with a bit of ghee or virgin coconut oil. Place each piece of shaped dough in the hot skillet right away. If the pan isn’t hot enough, or the dough is rolled too thick, it won’t bubble. If you’re concerned, cover the skillet. But don’t make the skillet screaming hot, or it’ll just burn the bread. Once it bubbles, flip it to the other side. To make sure that all of the dough comes into contact with the hot skillet, I’ll occasionally press down on the dough with my spatula. It should puff right back up. Flip and cook a few times until the dough seems puffy at least in spots and cooked through. Serve it right away! I haven’t made this recipe with most of these substitutions, but I feel confident that it can be done successfully here. Please remember, as always, that the more substitutions you make, the further you are straying from the original recipe and the more unpredictable your result will be. Dairy-free: The dairy in this recipe comes from the plain yogurt and the butter or ghee. I recommend replacing the butter/ghee in the dough with extra virgin olive oil. I actually have made this recipe with olive oil in the dough in place of the butter or ghee, and I prefer it because it has some depth of flavor that many other butter substitutes I can imagine. Since olive oil is pure fat and a liquid even at cold room temperature, the dough will be a bit softer and less pleasant to shape, though. Try replacing the plain yogurt with a nondairy plain yogurt. My favorite nondairy plain yogurt is made by So Delicious. Silk is fine, too. I really don’t care for Kite Hill or any of the other almond-based nondairy yogurts I have tried. Cooking with something you otherwise might eat only serves to intensify the flavor of the ingredient, so if it tastes slightly off to you, don’t cook or bake with it. Egg-free: The eggs are harder to replace in this recipe than the dairy. You can try replacing the whole egg with a “chia egg” (1 tablespoon ground white chia seeds + 1 tablespoon lukewarm water, mixed and allowed to gel), and the egg white with aquafaba (the water from a can of chickpeas/garbanzo beans). Yeast: There is no replacement for yeast in a yeast bread recipe; you just need a different recipe entirely if you can’t have yeast. I recommend trying my recipe for yeast-free pita bread, or even my Weight Watchers-style yeast free pizza recipe and shaping it into a naan-style dough. In the bowl of your stand mixer fitted with the paddle attachment, place the flour, xanthan gum, salt, cream of tartar, and sugar, and whisk to combine well. Add the yeast and whisk again to combine. Add the yogurt, butter or ghee, egg with egg white, and the water, and mix on low speed with the paddle attachment until just combined. Once the water has been absorbed, turn the mixer up to medium speed and mix for about 3 minutes. The dough will most likely be quite fluffy but will come together and thicken, then begin to pull away from the sides of the bowl in spots. It will not turn into a fully integrated ball of dough on its own. Turn off the mixer, scrape the dough off the sides of the bowl with a spatula, and gently press it into a ball. Place the dough in a greased bucket with a lid (or a bowl with a lid or one you can cover very tightly), and cover tightly. If you plan to make naan the same day, place the dough in a warm, draft-free spot to rise until it is nearly doubled in volume, about 45 minutes. Alternatively, place the well-sealed container in the refrigerator for up to 2 to 3 days, and work with the dough straight from the refrigerator. Once the dough has finished rising, turn it out onto a lightly floured surface and sprinkle lightly with more flour. Divide the dough into 8 pieces, each about 95 grams. Working with one piece of dough at a time, lightly flour it and roll it into a round, then use a rolling pin to roll it into an elongated oval about 3/8 inch thick. While you’re shaping the dough, place about 1 tablespoon of ghee or virgin coconut oil in a cast iron skillet, and melt over medium-low heat. Place the first piece of shaped dough in the heated skillet and fry on one side until large blisters begin to form (about 30 seconds). Flip and fry until the underside is golden brown. Flip the bread again and cook until browned all over, about another minute. Remove to a paper towel or tea towel, and cover the dough to retain the heat and moisture. Repeat with the remaining pieces of dough, adding more fat to the skillet as necessary. Stack the pieces of naan one on top of another, keeping them covered with a tea towel to maintain freshness. Serve warm. Originally published on the blog in 2012. Recipe unchanged, photos, video, and text new. I’ve noticed most of your bread recipes use instant yeast even with a long rise time. Can you explain the reasoning? Would you be willing to speculate if traditional yeast would work if I proofed it in the warm water and a bit of sugar? The only difference between instant yeast and active dry yeast is the coating on the outside of the yeast in active dry that prevents it from becoming active without being proofed. It has nothing to do with the length of the rise. It’s much simpler to save the step of proofing, which is why I use instant yeast. If you’d like to use active dry yeast, you’ll need to proof it first, and you’ll need to use more of it (approximately 125% as much yeast, so you’d multiply the amount (by weight) of instant yeast by 1.25). We made this directly from the book last weekend and I’ve never heard such a satisfying quiet as everyone chewed and occasionally muttered with a full mouth, “this is really good.” Now my Ethiopian cookbook won’t go to waste. While I’m not up to making injera on a regular basis, I could make this a couple times a week and not complain. Thank you again! I’m so glad, Julie. Let’s never do without! Is there a substitute for the sugar that you would recommend? Hi, Jodi, I’m afraid I haven’t tried substituting the sugar, and it helps to feed the yeast. I would really recommend leaving it as is, especially since it’s not very much. Sorry! Hi, trying this on Saturday – how early can we make it, we have a warming drawer, can we make it earlier in the day and then keep it warm in the warming drawer in alum foil? I’m honestly not sure, Marty. All bread, gluten free or not, is best made soon before it’s served. I am actually concerned that a warming drawer would dry it out. I really recommend keeping the dough raw, in a sealed container in the refrigerator, and fry it before serving. If you want to make it a few hours in advance, seal the naan in a ziptop bag with a moist paper towel and keep at room temp. Then, refresh in a hot skillet right before serving and it will be great. I love naan and I’m supposed to go glutin free to help with inflammation so I’m going to try this recipe it sounds great if i can get a mixer can u make it without one? I discuss that in the post, Jessica! Please have a look. This is a fabulous recipe! Loved it. As I discuss in the post, Diane, I’m afraid not! Have you tried using coconut oil in the dough itself? Actually I have, Kealoha! It’s not my favorite thing, though, since similar to when the butter is replaced by olive oil, the dough is somewhat more difficult to handle. Nicole, Do you have suggestions about how long these can be kept and how they should be stored? Really looking forward to trying them! Hi, Diane, I really recommend storing the raw dough in a well-sealed container for up to 3 days and only frying the pieces you plan to use that day. You can keep cooked pieces of dough in a well-sealed plastic bag at room temperature for the following day, and then refresh them in a hot skillet before serving, but they’re best fresh. Will the recipe work using dairy free yogurt? Please see the Ingredients and substitutions section in the post for a detailed discussion, Maria. All of my thoughts are right there! Making this tonight with curried fish, rice and green beans. Can’t wait! It’s the bread I crave the most! I have to try this! Hugs and Kisses to you! Woo Hoo! Chicken Tikka Masala here I come! I’m not a fan of Indian food but Naan sounds like a great choice to go with a bowl of chili. Spread a bit of garlic butter on it & top the chili with some chopped onions & grated cheese. A great cold weather meal! Naan isn’t spicy or anything. It’s just a really flavorful, yeasted flatbread. It would be great with a bowl of chili. It’s soft, too, so you can even fill it and fold it over into a sandwich. I love the sandwich idea! Lots of love from my kitchen to your kitchen! Thanks for all your great recipes & ideas!!! ooh.. def gonna have to give this a try. Hubby feel in love with Naan while he was stationed in Kosovo a few years ago. I’ve never had it, so trying to recreate it for him hasn’t been going well. All the recipes I’ve found so far, he didn’t like or just weren’t right.. here’s hoping this one will satisfy him!! Naan pizza…mmmmmmmmmmm :) Thank you!!! If you get that bread proofer, I’m sure you won’t be disappointed. I really love it. Thanks to your facilitation, my bread proofer will soon be on its way to me! Thank you for upgrading my role, then, Linda. It sounds much more respectable. Enjoy the proofer! Can’t wait to try this one Nicole! I love love love naan! My 25lb bag of flour arrives today. Wonder what my afternoon activity will be? Is Ghee the more traditional thing to use? I have Olive Oil but could go out and find some ghee if it adds that little bit extra. I have sort of fallen out of love with olive oil unless I’m using it raw, to be honest. It degrades quite easily. I really like ghee for its high smoking point, especially for frying. But you can absolutely use olive oil with very good results. I can’t believe you went to all the trouble of making gluten-full naan for your family! If I’m making it, I need at least be able to eat it. GF naan for all!